Finding the right overdrive can seem like an almost impossible task. Itâ€™s often either too bright or too dark or, it lacks the needed mid range to be able to cut through a band mix. It always depends on the amp and in many cases, going for the old trusted circuits can pay off. 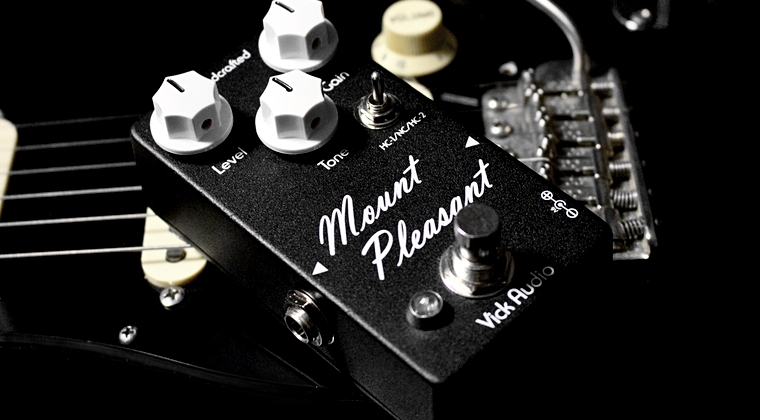 Vick Audio recently released the Mount Pleasant Overdrive. Hereâ€™s my review. For years I used typically mids scooped overdrives like the Powerbooster and Tube Driver. I still use them but as Iâ€™ve gone from exclusively using Hiwatt-type amps to more scooped and less compressed amps, I realised that I also had to expand the overdrive collection to be able to produce the same tones on different sounding amps. Iâ€™ve been a fan of Vick Audio for years. Mike always comes up with new takes on classic designs that, at least for me, solve a lot of issues. His Tree of Life and â€™73 Ramâ€™s Head in particular has been staples in my touring and recording rig ever since I got them. Mount Pleasant is based on the Marshall Bluesbreaker tones. You know that old amp made famous by THAT blues guitarist on THAT album. Marshall also did a pedal based on that amp but some of the complaints was that it had too little gain, too much brightness and not enough output on lower gain settings. So how does David Gilmour fit into all of this? Well, the Tube Driver, which has been Davidâ€™s main overdrive unit since the early 90s is loosely based on those early Marshall amps and the JTM and Bluesbreaker in particular. Itâ€™s certainly not a Marshall in a box but it has much of the same amp-like qualities and a bit of that raw, untamed breakup known to these amps. One issue with the Tube Driver is that it doesnâ€™t have enough mid range and compression to fit all amps. Pairing it with Fender, Vox and other typically scooped amps, often makes it sound harsh and thin. Same goes for bedrooms setups. The Mount Pleasant has the mid range and compression you need to get smooth tones no matter what amp you pair it with. And, it sounds great on low volume and bedroom setups too. A 3-way toggle allows you to switch between flat or two different high end cuts for bright amps. It makes the pedal blend better and easier to tame. Compared to similar pedals, the Mount Pleasant works great as a clean booster too. Set the volume at around 75% and roll back the gain for a nice and fat boost that works great for fattening up cleans or a thin sounding overdrive. This is not a distortion pedal but with the gain all the way up you can get some pretty heavy sounds for humbucker riffs or for replicating Davidâ€™s solos on Have a Cigar, What Do You Want From Me, Rattle That Lock and similar. The only thing I can put my finger on is that I would like a bit more low end. Too much can often create some flabby bass frequencies but some amps needs a bit of boost in that range. Other than that, I think Vick Audio nailed it once again. The Mount Pleasant is a versatile overdrive suitable for any amp, stage and bedroom setups and a great alternative for those current Gilmour overdrive tones we all search for. See vickaudio.com for more details. I see you’ve been using a sennheiser 609 mic on your recordings. Is it the silver or black edition? Do you prefer it over a shure sm57? I’m using the E906. Haven’t tried the 609 so I can’t really tell although I think they’re very similar. I don’t hear much of a difference between the 906 and SM57 but the 906 is easier to place I think. At least on my cabinet and with my tones. I do prefer the SM57 for really high gain stuff though. It seems to compress less. I’m going to check out the 906, then. May I ask where are the differencies? I’m alternating between the Shure SM57 and Sennheiser 906e. They sound more or less the same. The 57 is perhaps a tad brighter but it has more mids too. I don’t know, the 906 is just easy to hang in front of the cab, which makes it easier to just fire up the system and start recording. I often use the 57 when I need to use a special angle. It also sound better with high gain pedals and tones. Good to know, thank you! And keep going with this great job! Totaly agree with the difficulty to match overdrive with fender blackface amps, I used to play on a self built tweed super 5F4, and i had a xotic BB preamp and a JHS charlie brown. Recently i used to play with a vibrolux blackface, and my BB preamp and JHS gave me a harsh thin tone : the limits of “amp in a box” pedals where reached, and for the JHS, the formula SCOOPED MIDS OVERDRIVE with SCOOPED MIDS amp doesn’t give Ã good tone. Bjorn, not sure if this is the right place to ask….i just got a clone of this famous box. Hard to tell. Looks more like a studio outboard unit and you never know what they might have used in the studio. I’ve never seen David use one but these things could be used for any instrument, vocals and mixing. Very nice sounds you presented us from that Vick Audio. Sweet! Have you ever tried that old black version of Tube Driver, the Real Tube from Tube Works (also with signature of B.K.Butler)? It has a mid control in it. I have one and find it very useful to push the mids a little bit, although a very limited control indeed. This version has lower gain than the Chandler and the current version of Tube Driver. But I also find it a more creamy overdrive too. Just looking for an overdrive to set with my marshall 8080, and my strat (with Pribora pickups); I often play with a bedroom level, and I wonder if that Mount Pleasant, will be suitable ? I like too the dumble sound, and low gain overdrive. Great site, it’s a gold mine ! Hi Patrick, blending a Marshall amp with a Marshall pedal can create tones with a bit too much mid range and high end but it depends on what tones you want. I would probably go for something with less midrange and comrpession, like the BD2. How would you compare this with the tree of life? I like Vick’s pedals an awful lot and would like to hear more about differences and similarities that you’ve noticed so far. The MP is considerably brighter, with less compression and gain. I suppose this Mount Pleasant would be closer to the Overdriver? If you had to pick up one of those two to take onstage, which would you choose and why? Not really. The Overdriver has a large headroom and very little mid range and compression – unless you really crank it. The MP is perhaps best described like a cross between a Powerbooster/Overdriver and Tube Screamer. Thanks again, with so many great products to choose from and so few feet, it’s always hard to know what to order! I am also a fan of Mike’s pedals and was on the fence about this one in particular from the video reviews that were available so far, those reviews just didn’t quite capture what I wanted to hear from this pedal…but your review sold this pedal for me, thank you Bjorn, your honest reviews are a preferred source for me. BTW I’m loving the new Solo album! Brilliant work! So, if I want an overdrive that can reproduce those 90′ to today sounds and Cover the overdrive needs with the Help of the Buffalo FX Powerbooster, should I go with the tree of Life or the mount pleasant? Depends on your amp. Both pedals will do what you describe but I guess the ToL is better for brighter amps, whereas the MP is better for darker amps. Hey Bjorn, I don’t want to tell you how to run your blog or website or anything, and I know this is a rather ambitious task, but do you think you could go back through all the album’s and all the songs and see if you could get all the delay settimgs? Also maybe do a post here on the blog since delay is such a huge part of Gilmour’s tone. Thanks for all the information you have already! Awesome, I can’t wait. I have a TC Electronic Nova Delay and I can’t wait to make presets!